GPS,A-GPS,Wi-Fi,WIFI hot,PC DS( Data Synchronism ),Caculator,Email,Alarm,Calendar,Recorder,Call recorder,Gravity sensor,Accelerometer,Range sensor,L-sensor,OTG,Bluetooth mouse,Bluetooth keyboard. UNLOCKED DUAL SIM SLOT - GSM：B2/B3/B5/B8; WCDMA: B2/B4/B5; FDD: B2/B4/B5/B7/B17.-US Compatibility Nationwide on all GSM Networks including AT&T, T-Mobile, Cricket, MetroPCS, Straight Talk, Pure Talk USA, and others, please contact your carrier when you don't know if your carrier can work with this phone. STUNNING DISPLAY - The Padcod M98's brilliant 5.72 inch HD Display will give you an immersive view from every angle. You will find the Full HD 1080x720 pixel display for the ultimate viewing experience. Just about everything on this phone will look sharp and vivid. PROCESSING POWER - With a Mediatek MT6737V/W chipset providing a 1.3GHz Quad Core processor, the Padcod M98 is a powerhouse for performance. 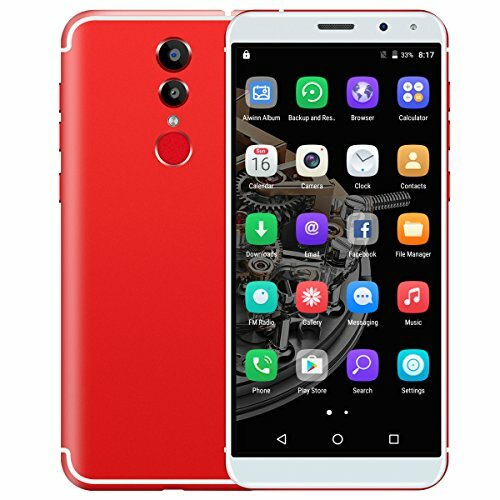 Paired with 1GB RAM and ROM 16GB, it will meet all your needs whether it be for productivity or leisure, run most of the APPs, except Large-scale games. CAPTURE YOUR MOMENTS - Those moments you definitely want to capture in all their glory will be caught effortlessly with the new M98. With a 13 megapixel main camera equipped with a state of the art IMX 258 sensor, working in tandem with a 5MP selfie camera. Each and every memorable image or video will be cherished forever. INNOVATIVE DESIGN - Designed with a perfect blend of style and function, the new M98 offers a clean and gentle looking smartphone with slim phone body, with fingerprint scanner, this phone brings total security and convenience to the table with a simple swipe of your finger. Easily unlock your Smartphone and access all your music, videos, and pictures.